Description: (Obverse) the standing figure of Victory holding a palm branch in her right hand and stretching out with her left hand; (Reverse) a laurel wreath containing the four line inscription THE GREAT WAR FOR CIVILISATION 1914-1919. Comments: This medal was awarded to all services of the British armed forces that had already received the 1914 Star or 1914-15 Star and, with certain exceptions, to those who received the British War Medal. 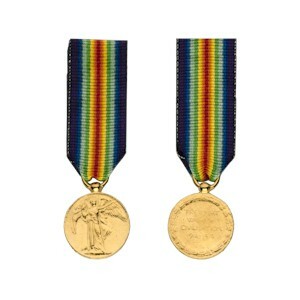 It was often known as the Allied War Medal because the same basic design and double rainbow ribbon were adopted by thirteen other allied nations.